We are lucky to be always within 50 miles of the coast in N. Ireland-even in deepest Tyrone! In less than an hour’s drive in almost any direction , I can hop out of the car, look across the sea, and feel freedom and anticipation- rooted (in my case) in Sunday family picnics near Newcastle or Ardglass. Most walkers enjoy the coast; the sound and sparkle of breaking waves, the touch of a sea breeze on the skin, the cries of gulls and the sea smell, all have a relaxing effect. We were once told that sea air contained ozone, but "seaside smells" are more likely due to a mixture of chemicals-algae and decay products from the sea itself. Ice-cream and sunscreen oils add their own contribution. The variety of scenery - beaches to dunes, shingle to rocky shores and salt marshes to coastal cliffs, all enhance the feeling of being alive. 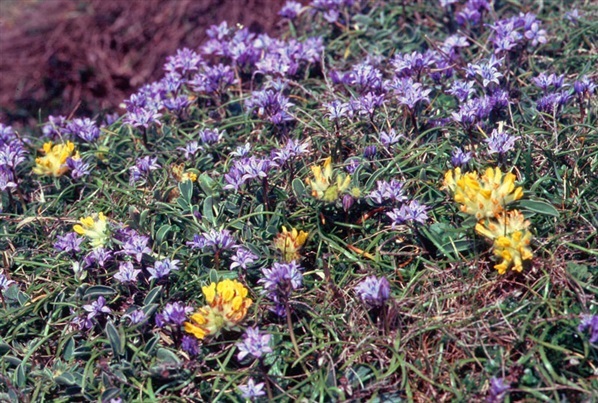 Seaside plants have evolved to survive and flourish in tough conditions along unique coasts. Wind seldom completely abates, sand, mud and thin soils with a high salt content dry out quickly and sea- spray is more or less continuous - Coastal plants need to be tough! Have a walk along the shingle and pebbles at the top of many beaches-the toughest environment of all for seaside plants. What might we see? Common Scurvy-grass is hard to miss on the shingle of beaches in May. 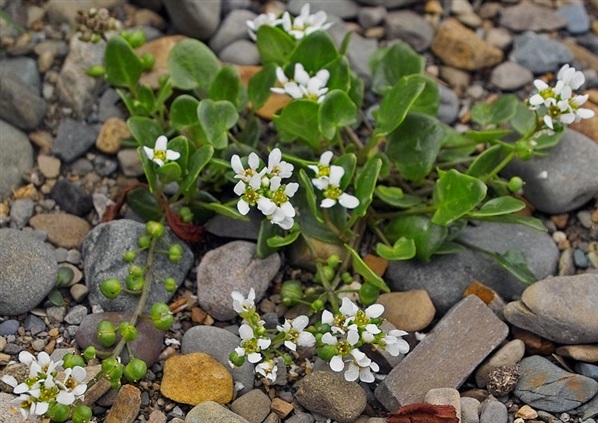 Along some motorway verges, the seeds of a closely related species (Danish Scurvy Grass) have been spread from wheels of lorries arriving off cross- channel ferries. No doubt, de-icing salt helps the plant feel at home! Why the name? The plant has fleshy leaves containing vitamin C. Scurvy was caused by a lack of vitamin C in the diet, so eating the leaves gave some protection against the illness. 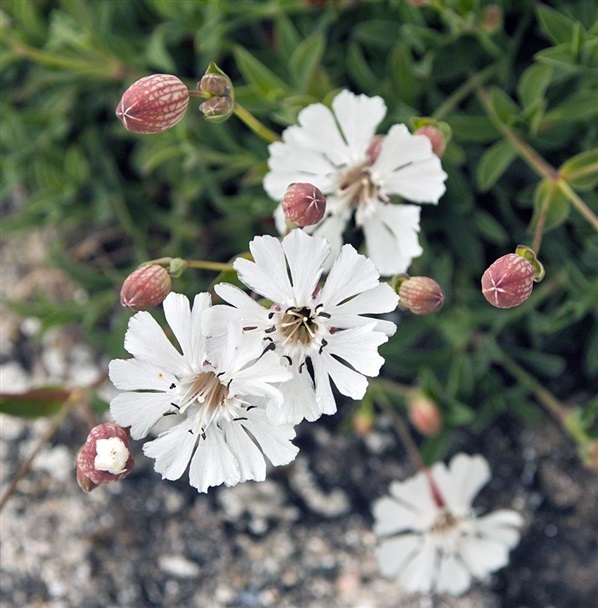 Sea Campion is found on shingle beaches, cliffs, dunes and waste ground near the sea. The almost pure white flowers are produced from mid-April until August. A plant of beauty, but often passed by. 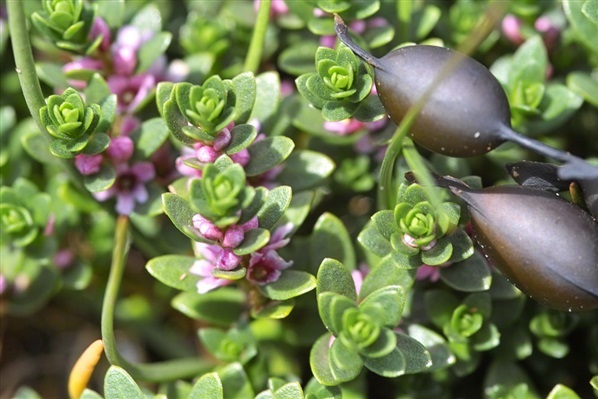 Sea Milkwort, found growing in compact mats on the shingle of most beaches, has tiny pink flowers and small fleshy leaves .The compact and fleshy nature of the plant helps to conserve moisture. 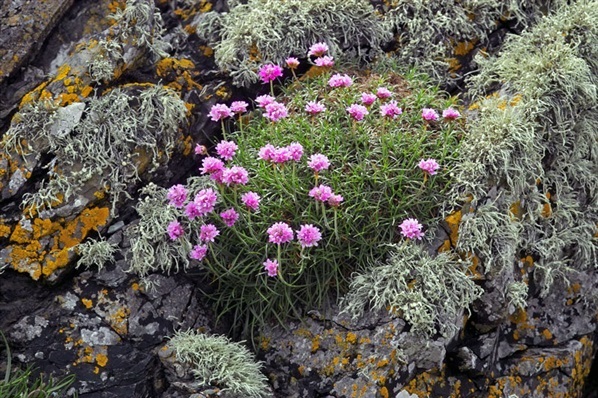 Thrift at its best in May, produces drifts of pink flowers on rocks and along cliff paths. Most will not remember three-penny piece coins, you are too young! The globular flower-heads on the coin were thrift flowers. 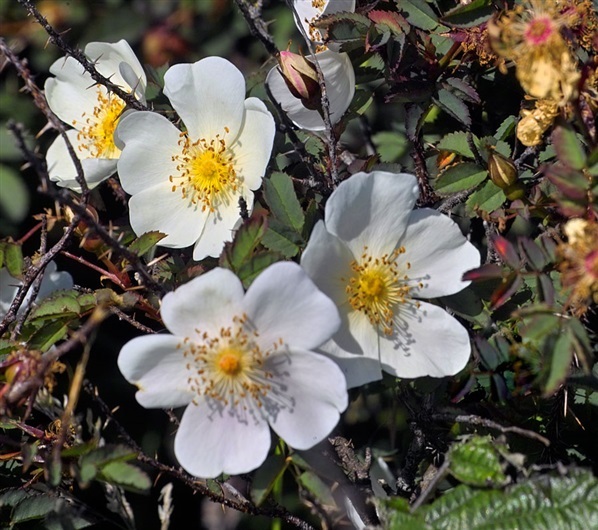 In late spring, in thickets amongst dunes and sand-hills, Burnet Roses with beautiful pale cream flowers are in bloom.They are very spiny (the spiniest rose of all) and can cause unpleasant scratches. The hips are purple-black, other roses have red hips. Varieties of this plant have been used as garden plants. ‘There is pansies , that’s for thoughts’ wrote Shakespeare. 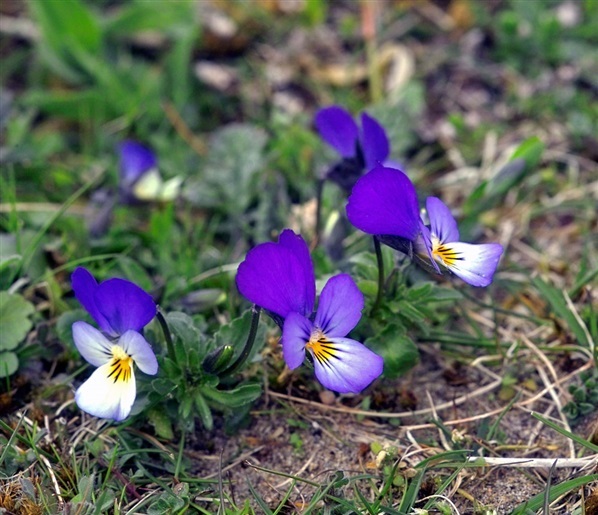 Short grassland behind a beach will invariably have wild pansies with yellow or violet-blue flowers (two separate varieties), often in flower from April until late summer, but best in May. Rest-harrow has pink pea like flowers throughout late spring and summer, among dunes or grassland behind the shoreline-but not found everywhere. The name comes from the difficulty caused to horse- drawn ploughs or harrows by the tough roots. Rest-harrow eaten by cattle taints milk, butter or cheese, so farmers certainly don’t like the plant. Fortunately it seems to grow mostly on the coast. The roots were once chewed like liquorice, but I confess I have never tried it! Would I have a favourite? It has to be the Oyster plant and I have two good reasons. The flowers, out in late June are a wonderful shade of azure blue with touches of purple. The other is rarity. Oyster plants grow among shingle and pebbles on a few beaches along the Down coast Fleshy grey green leaves cut down water loss and were once used as either raw or cooked ‘greens’. The plant is much too rare for that now! We are at the plant’s northern limit, I hope you find it! The search is worth the effort. Tyrella or south of Bloody Bridge near Newcastle are likely spots. Common Stork’s-bill. 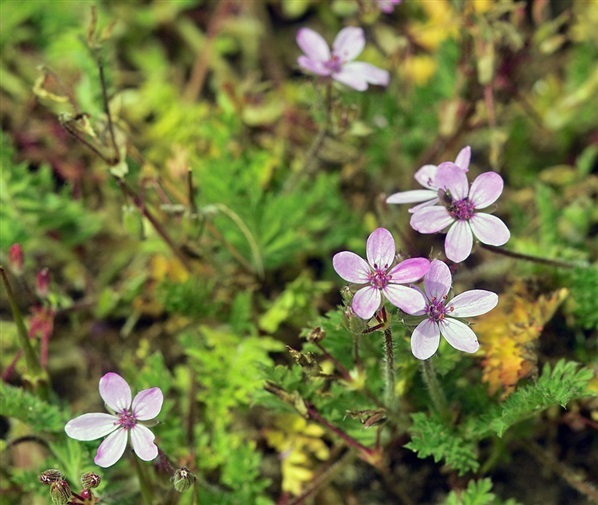 Pretty pink flowers of Common Stork’s bill arise from a rosette of dark green, finely and deeply cut leaves. The flowers open in the morning, are pollinated, and gone by mid-day. Examine the plant- the name Storks-bill comes from long beak- like seed pods. Common Stork’s bill is found on dry sandy heaths near the sea. Spring Squill grows on short turf near the sea and is at its best in May. Grassy hillsides sloping west on Rathlin Island can become a haze of blue with Spring Squill. 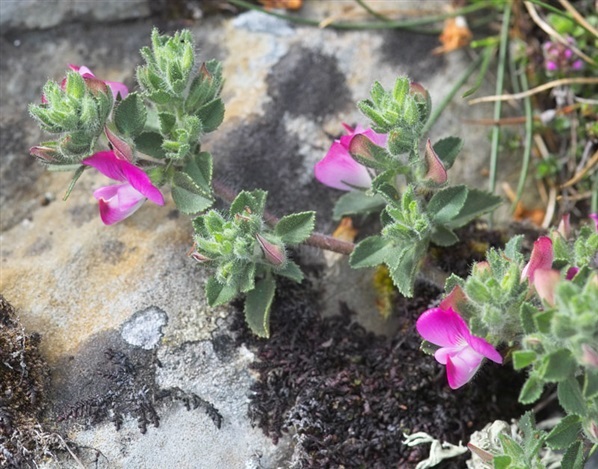 The plant is still be found on grassy slopes above the sea south of Ardglass. Yet, it is a plant often missed. Sorry about the poor photo which includes Kidney Vetch , I will take a better one soon! Yellow Horned Poppy is found infrequently on rough stones at the top of storm beaches, you will be lucky to find it. The best site locally is a storm beach beyond Bloody Bridge, south of Newcastle. 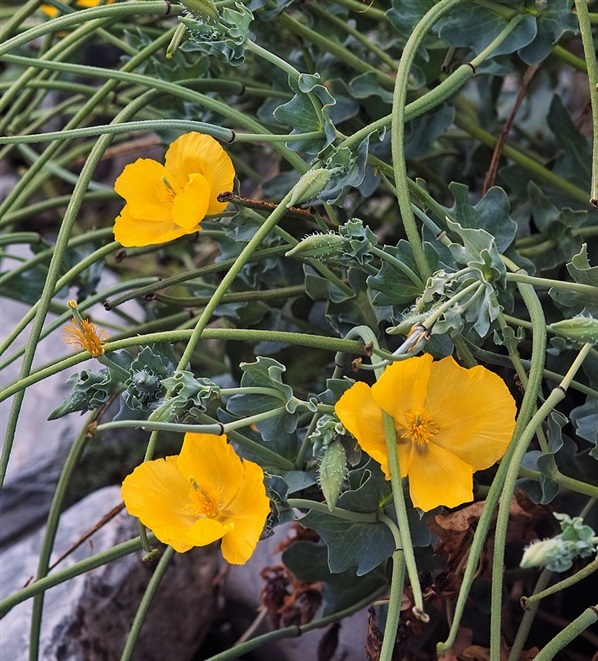 The plant produces bright yellow flowers in early July, and later, long narrow seed pods . Remember all parts of the plant is poisonous. Long-headed Poppies are much more common and found abundantly in sandy fields along the coast from late June until September . The name ‘long headed poppy’ is descriptive of long narrow seed pods produced after flowering. Poppies ‘en masse’ must be one of nature’s finest sights. 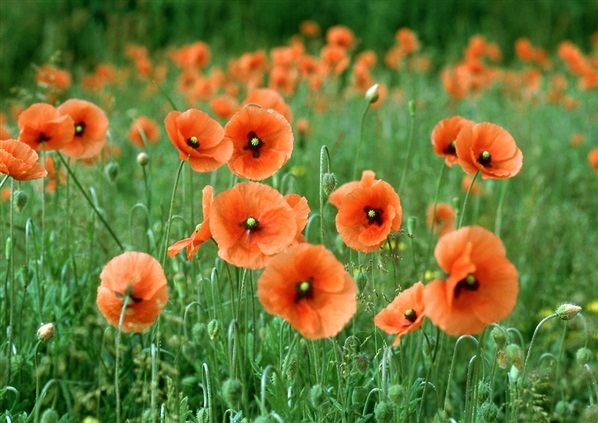 This is not the Remembrance Day poppy -much less common here in N. Ireland. 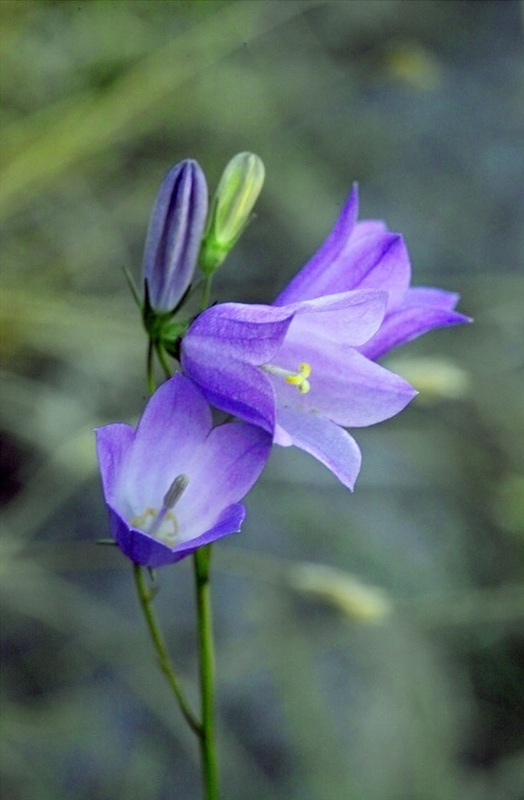 Harebell flowers in July- a colourful sight for walkers on coastal cliff-tops such as the Giant's Causeway or amongst dunes. The plant has been given many names, among them ‘witches thimbles’ and ‘fairy bells’. This is the true ‘bluebell’ of Scotland –not the woodland bluebell. 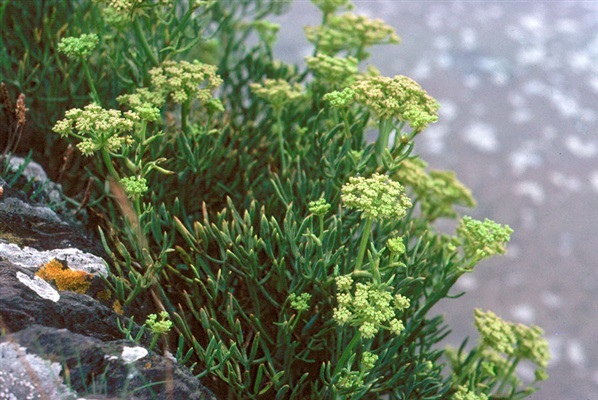 Explore rocky sections of coastline or coastal cliffs from July until the end of August and you might find Rock Samphire, once eaten as a vegetable and cooked like Asparagus,or pickled. Native islanders on St.Kilda scaled cliffs for samphire and fulmar’s eggs to supplement their limited diet-a dangerous business! Shakespeare refers to the practice in ‘ King Lear ’. ‘Half way down hangs one that gathers Samphire,dreadful trade’. Orchids are my favourite wild-flowers. Rare ones are elusive, often requiring long journeys or patient searching. 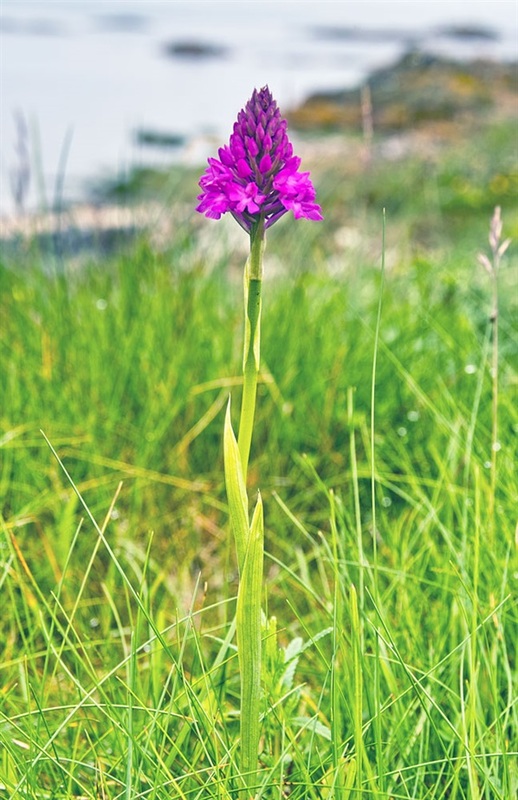 In July, amongst dunes and often only yards behind beaches, elegant spikes of ‘Pyramidal Orchid’ with magenta/pink flowers dot the dunes. 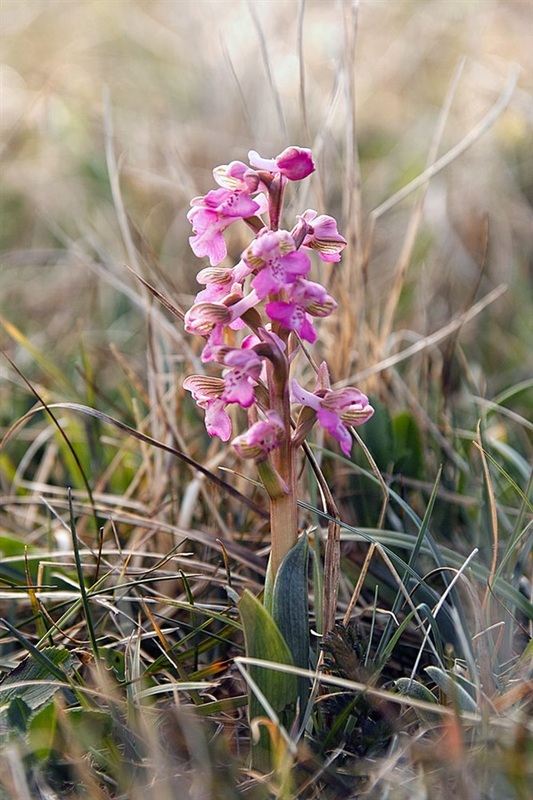 Green- Winged Orchids have only one site in N.Ireland - an area not much larger than a helipad,so you might not find it! You can’t get much rarer than that. However, the plant is fairly common in parts of England. The flower spike shown is a beautiful pale variant. Most specimens are magenta in colour. Early July is best time for this orchid on the only known site- 30 yds from the sea. 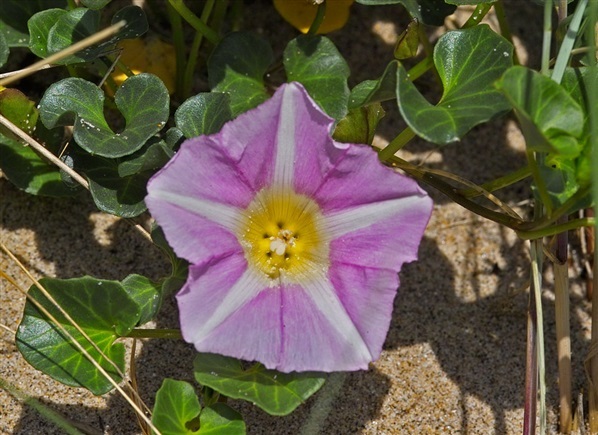 Sea Bindweed is very local with one reliable site, immediately across the Bush river, and where the dune system begins at Portballentrye. The picture shows the thick fleshy leaves needed for coastal survival. 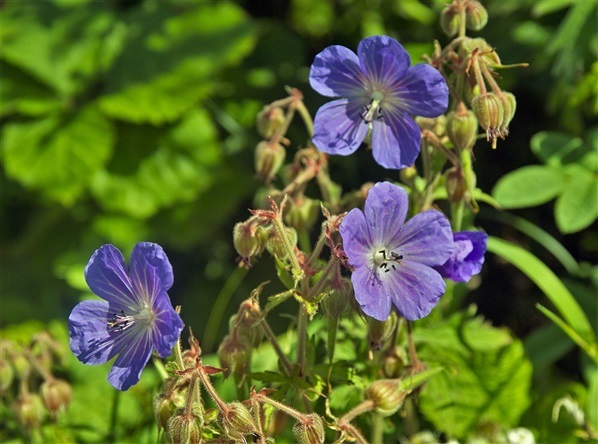 In July, along the coastal path between Whitepark Bay and Ballintoy, look for ‘The flower of Dunluce’ or Meadow Cranesbill, a plant you should not miss. Not found elsewhere in Ulster, but quite common in England. 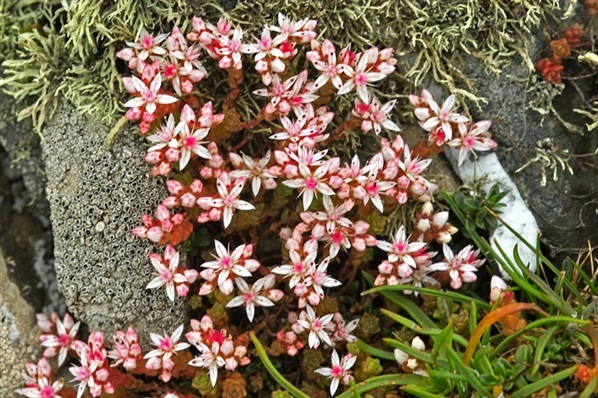 The little plant below with small succulent reddish leaves and star-like white flowers is English Stonecrop. 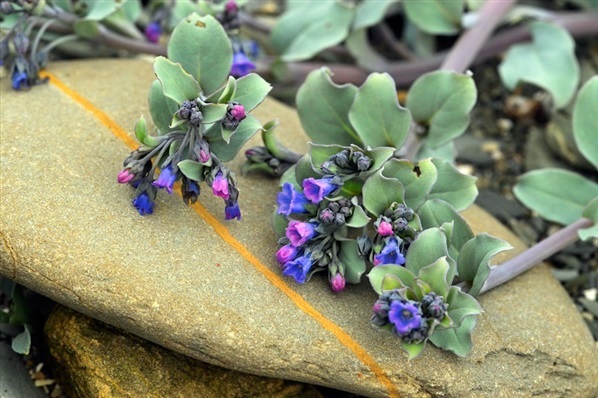 A lover of warm hollows in seaside rocks, it produces flowers from June until September and is sometimes even invited into gardens. A close relative, Biting Stonecrop, bright yellow in colour carpets stretches of flat sandy ground in Murlough Reserve near Newcastle. I have left many out and they don’t deserve it. Wild Thyme, Tree Mallow, Spurges, and lots of Orchids, so take that flower book with you, and maybe a camera , and dander along the coast. Search for coastal walks on WalkNI.com and get out and allow your mind to escape from a busy world for a few hours. A retired chemistry teacher and a hill-walker for more than 30 years, Ronnie has been on the UFRC Committee since shortly after retirement. He has a keen interest in Natural History and photography which he combines with his love of hill-walking. Having taken up web design on retirement he now runs his local walking club website www.midulsterwalkingclub.org.uk and his own photographic site www.ronniepics.co.uk as well as finding the time to be a walk volunteer ranger with Outdoor Recreation NI. Thank-you for sharing your knowledge and photos of wild flowers. The simplicity and purity of these flowers is beautiful. We will have to head to the coast more often, where the hills and sea can be experienced. Stunning photographs and very interesting information! A large boost to my limited knowledge of coastal flora!